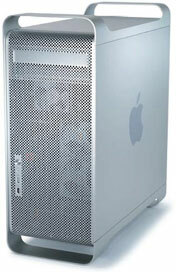 Five years ago this week, on June 23, 2003 (although it seems longer somehow), Apple Introduced the G5 Power Mac, claiming it to be “fastest personal computer ever” and “first 64-bit personal computer”. Speculation soon began about the possibility of a G5 PowerBook. Not so much at first, since the G5 was launched as a power chip in Apple’s pro desktop towers, but by January 2005 it was definitely the buzz. To the disappointment of Apple ‘Book aficionados, Macworld Expo came and went with no PowerBook announcements. Not even a hint of when -or if – a G5 PowerBook might be on its way. I was always a bit of a G5 PowerBook skeptic and found myself becoming more rather than less of one as time passed. Indeed, I was beginning to think the if ever more plausible all the time, remembering that almost from the introduction of the first PowerPC PowerBookin 1995, the 5300, rumors and speculation swirled about an imminent PPC 604 PowerBook in the works – a machine that never materialized. There was plenty of reason to speculate. The PowerBook 5300 used an anemic PPC 603e chip, of which it is an understatement to say that it left much to be desired performance-wise. The 603 series chips were designed to be a smaller, lower power consumption variant of the robust PPC 601 chips that powered the original Power Macs in 1994. Unfortunately, the engineering compromises that obtained resulted in extremely lackluster performance, notwithstanding the hefty price tag of the PowerBook 5300. On the other hand, the Motorola PPC 604 chip, introduced first in the Power Mac 8500 in August 1995, like the earlier 601, was designed with desktop workstations in mind, without the low-power, low-heat, low-cost limitations of the 603. It had more powerful, sophisticated caching technology than the original 601. If you recall the large heat sink attached to a 604 processor in a desktop Power Mac, it was a clue as to what a challenge it would have been to shoehorn a 604 into even the thicker form factor PowerBook cases of the day and then keep it cool. In 1995, Motorola began producing a smaller, cooler-running version of the 604 called the 604e, which incorporated 0.35 micron fabrication technology rather than the 0.5 micron technology used in the 604, along with a unified cache instead of the 604’s split cache to store data and program instructions. Theoretically, the 604e might have been a candidate for laptop use. I wouldn’t be surprised if Apple engineers cobbled up a PowerBook prototype or two using 604e chips, but no 604-based PowerBook ever made it into production. When the PowerBook 3400c was unveiled in early 1997, it had three different clock speeds of 603e processors. The first PCI architecture used in a PowerBook motherboard and a fast (for the day) 40 MHz system bus made the PowerBook 3400 the “fastest laptop on the planet” – at least for a few months – while 604 PowerBook speculation continued. 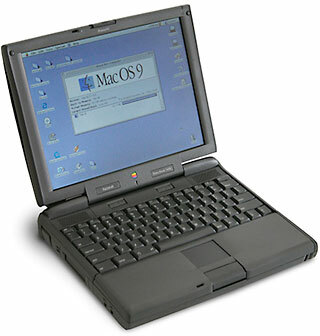 In the end, PowerBook technology took a quantum leap from 603e to G3 with the November 1997 introduction of the original PowerBook G3 (a.k.a 3500 and Kanga) that was faster than a 604 and eclipsed the 603e in performance. Why Not a G5 PowerBook? Tongue-in-cheek mockup of a PowerBook G5. Anyway, it certainly was beginning to sound like engineering a G5 PowerBook had been more of a challenge than Apple had anticipated, and IBM’s 90nm PowerPC 970fx wasn’t proving as laptop compatible as originally touted. However, it further muddied the waters when DigiTimes reported that same month that Asustek would start shipping iBook G5 notebooks to Apple in the second quarter of 2005, and that Quanta Computer would ship PowerBook G5s at a rate of 30K-50K per month by Q2 2005. This created a buzz among Apple watchers, and at the time I suggested that everyone keep their powder dry. With no sign of a G5 PowerBook yet, it beggared credibility that Apple could have a G5 iBook ready to go in a few months. Of course, by that time – or very shortly thereafter – Apple was cooking the deal with Intel that became the subject of Steve Jobs’ bombshell announcement at WWDC 2005. In my commentary on that, I expressed doubt that Apple will be interested in doing any major reengineering of the PowerPC PowerBook, which in any event would be a lame duck. Apple had been lengthening product life cycles since well before the Macintel announcement, and I just couldn’t see them allocating the development resources to getting a G5 PowerBook ready for market at that point – a deduction that would be proved correct sooner than I imagined. In the end, the PowerBook G5 turned out to be the biggest vapor non-story in Apple laptop history.